Spectra Group (UK) Ltd hosted an official signing of the Armed Forces Covenant (AFC) at their Herefordshire HQ on Wednesday April 3rd. A major innovator in tactical communications and a Top 100 SME supplier to the UK Government, Spectra is committed to supporting those that have served either directly or indirectly. With ambitions to achieve Gold Armed Forces Employer Recognition Scheme (ERS) status, the event formed part of Spectra’s commitment to mentoring other organisations to sign up to the AFC and aspire to achieve recognition in their own rights. Brigadier Richard Carter, Commander 11 Signal & West Midland Brigade, attended on behalf of the MoD and countersigned the Covenants of C4I, Kinetic 6, RWB Global and XReach. 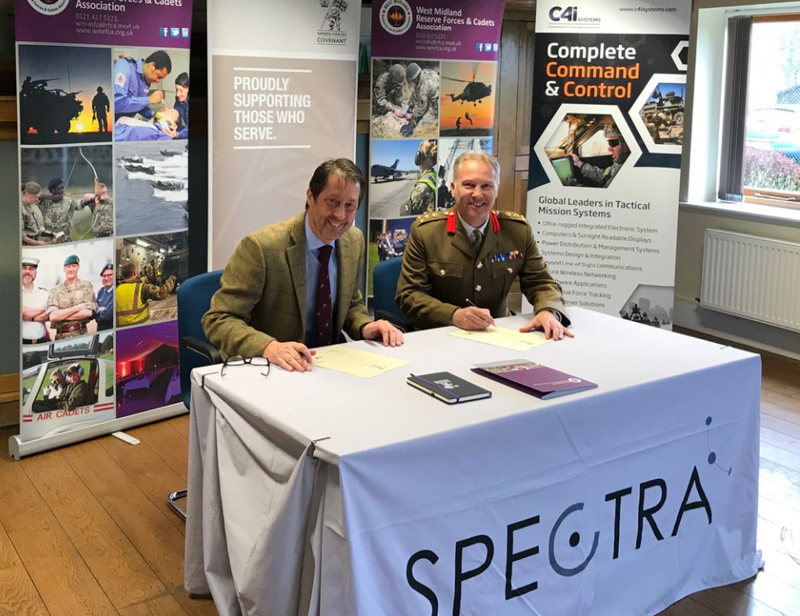 “On behalf of the Ministry of Defence and West Midland RFCA I can’t thank Spectra Group enough with their very evident support for the Armed Forces community and leading by example by bringing C4I, Kinetic 6, RWB Global and XReach Limited to the AFC family. To find out more about the Armed Forces Covenant and how your business could support the Armed Forces community visit our web page here.